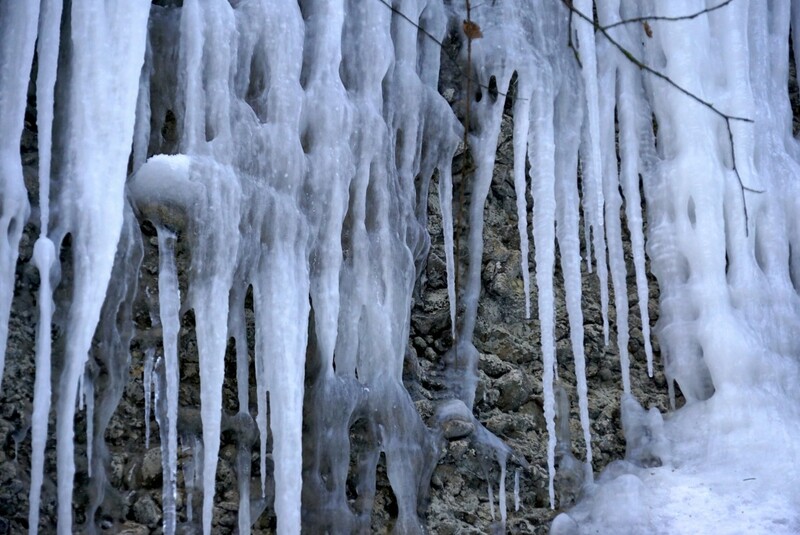 The melting water had frozen into long gleaming daggers that decorated the steep rock faces along the icicle trail of the Wirtatobel ravine. The night before the temperatures had plunged and we had to be extra careful navigating the sidewalks let alone an icy mountain path. January had been the coldest month in Austria in over thirty years and Franz and I had been on the look out for an exceptionally cold day to photograph a flow of water that we drive past to go cross country skiing in our local mountains. After capturing our shot we made our leave and a little side road beckoned us. And what a sight we saw. We were enchanted to find the ravine adorned with elegant icicles on both sides of the crevasse and the gleaming formations captivated us as we walked in silence enjoying the splendor of a Sunday morning hike up the magical gorge.